One thing I look forward to every summer is the watermelon! There are so many fun and tasty ways to enjoy it..... here's one that involves cookie cutters! 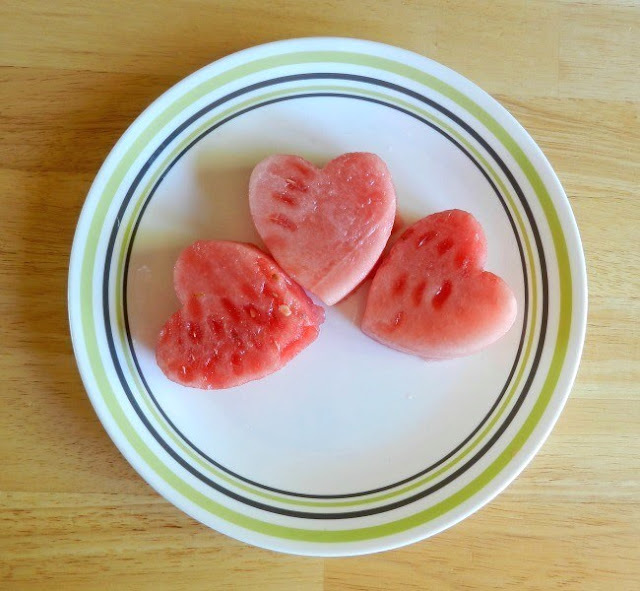 Step 1: Place a large slice of watermelon on a cutting board and gently press a cookie cutter into the watermelon. Step 2: Take the cookie cutter out of the watermelon slice and remove the watermelon inside the cookie cutter. Place the heart shaped watermelon on a plate and enjoy! Most of the time the prettiest things are the simplest things in life! This is one of them! Thanks for sharing this awesome idea! Fresh, sweet and simple!!! I love this idea! Thanks for sharing. Would love to have you visit me sometime. Visiting from Someday Craft blog party. So Sweet! Would love for you to share at Simple & Sweet Fridays. New Follower!